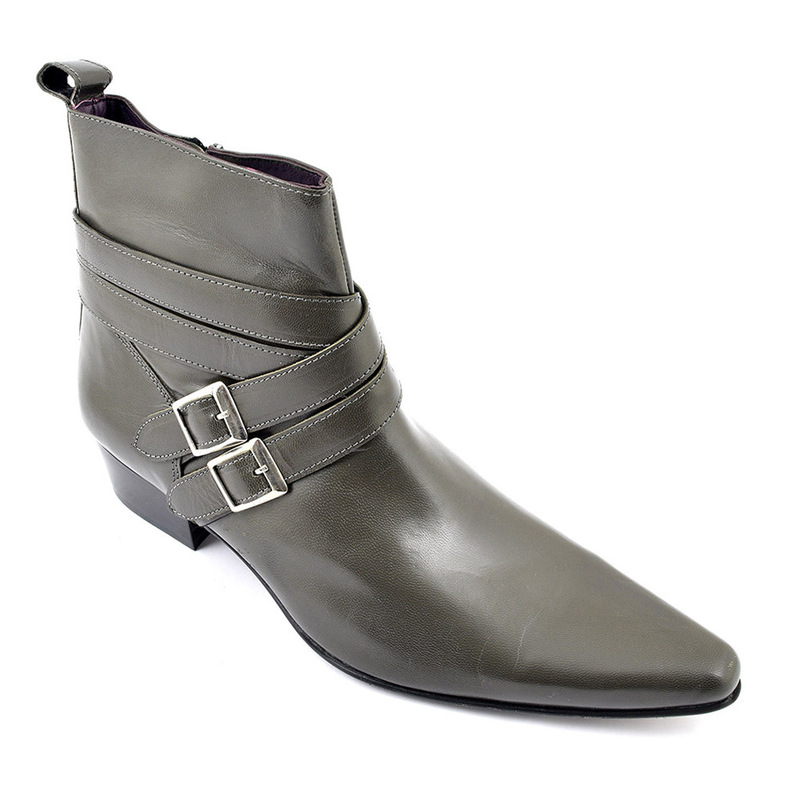 Beautiful grey buckle cuban heel boot for men with a double strap which fastens with a zip. These pointed toe beatle boots have a 45 mm heel and are very rock and roll! In fact, thats exactly where they originated from (see below for brief history). Swagger. 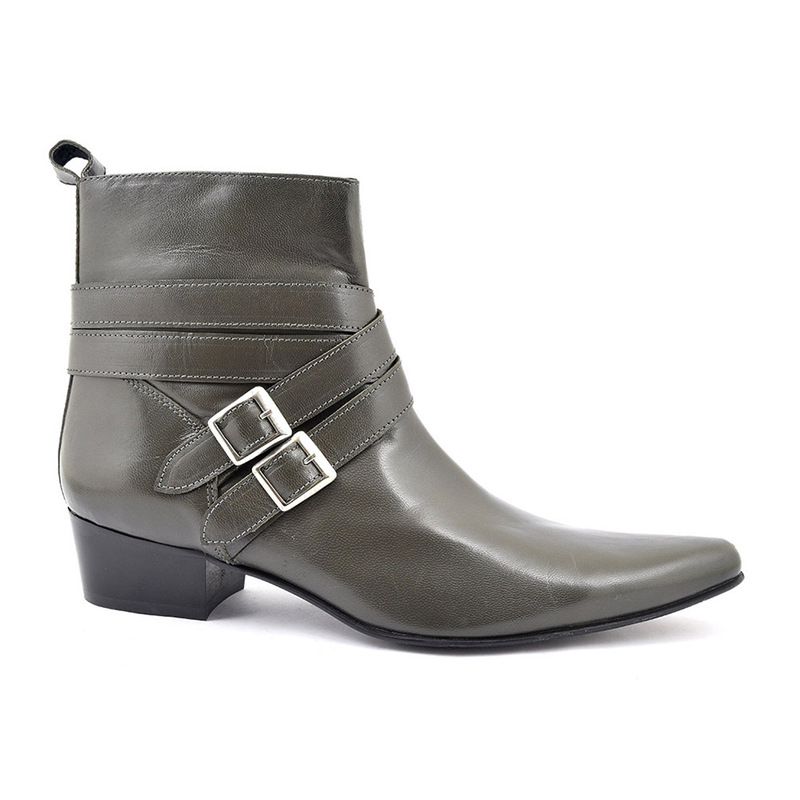 Thats what these mens grey buckle heel beatle boots have in spades. Speaking of the beach, the name winkle picker is also appropriate because of the pointed toe which derives the name from the seaside tradition of picking out winkles with a sharp object. Laugh you might but they are also called beatle crushers or mosquito chasers! 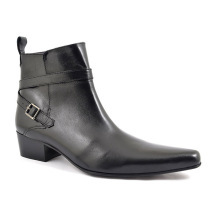 Whatever the name, these cuban heel boots have been a staple for rock royalty since the 60s. It all began with the popularity of the chelsea boot and The Beatles love of those boots. Story has it they asked shoemaker Anello and Davide to add on a cuban heel (called so after Latin dance) and voila! The Beatle boot or cuban heel boot was born. 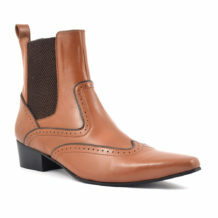 This style of pointed toe boots has been the preserve of the more original creative men out there. Many artists from The Stones to Prince have worn them. In particular, The Horrors have a fondness for a buckle heel winkle picker style cuban heel. In fact, subversive groups as diverse as mods, teddy boys, goths and punks have been seen in these slick mens boots. Although the buckle makes these grey cuban heels a little more rock and roll and you could see an Indie boy with a leather wearing them, you could see them with a snazzy suit just as much. 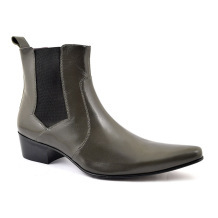 Whatever look you want whether it is modish, dandy or more edgy, these mens grey cuban heel boots will be just the ticket. Invest in a pair and express your originality. Gucinari is dedicated to style. Be the first to review “Arturo Grey Buckle Heel Beatle Boot” Click here to cancel reply.